Dairi clothing especially designed for the goddess in all of us. Bohemian hippy chick styles. Expressive clothing for artistic women. All of Dairi clothing is "FREE SIZE" and designed to look flattering on both Misses and Plus size women. Each garment is unique so you need to check the measurements of all garments carefully to be sure it will fit your frame. This garment is 65% cotton and 35% Rayon called "susti" "sousdi" or "susdi". This exceptionally fine fabric is handwoven and dyed in the Moroccan tradition.Each garment is dyed to order. Not only is this fabric extremely breathable and soft...like cashmere, it also accepts the dyes at such a high quality that you will be amazed at the depth of color you will see in this garment. This is Dairi's famous magic dress. It has two layers of fine susti material. The top layer can be worn in a number of ways to make your dress look like many dresses in one. The secret is that there are two loops at the shoulder of the dress where the top layer can be attached to create many styles. You can even bring the top layer over your head like a cloak! There are three styles of the magic dress: No Sleeve, Long Sleeve, and Long Sleeve with Fringe. 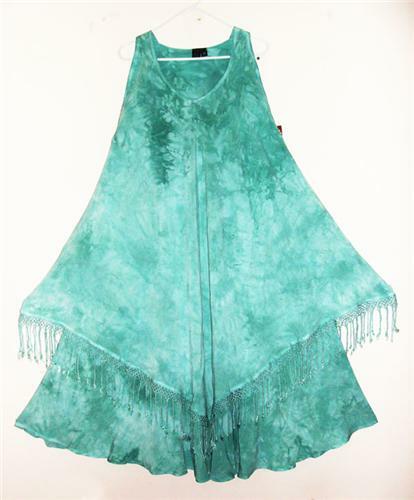 This auction is for the extra-large No Sleeve With Fringe style.Will fit sizes M L XL 1X 2X 3X 4X. Check the measurements below.